DNA modification is fundamental to design in synthetic biology. For this week&apos;s assignment, you will learn to read DNA sequence files and see physical changes you will make to DNA molecules. Lab Task: Verify restriction digest of a circular DNA plasmid by gel electrophoresis. Compare your experimental result with what you would predict from the plasmid map. Theory Task: Choose a DNA sequence that interests you from nature or a source like the iGEM part registry. Provide a detailed workflow for isolating or acquiring a molecule with this specific sequence and an assay that confirms part of its content. Tools to make specific cuts in DNA initiated discussion of “synthetic biology” as far back as the 1970s. The first of these genetic scissors were purified restriction enzymes, which are bacterial proteins that bind and break DNA at sequences they recognize to provide immunity to viruses. 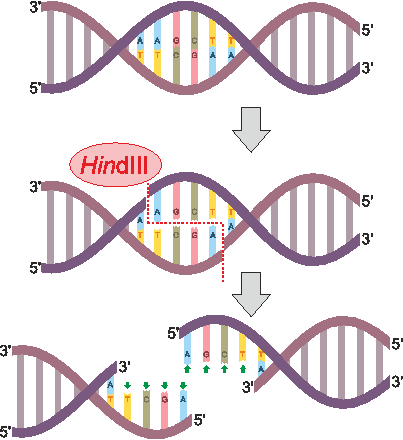 PvuII is an example of a restriction enzyme that recognizes CAGCTG and cuts (or “digests”) right down the middle (though restriction enzymes can also cut each strand in a way that leaves short overhangs, as seen for HindIII in the figure below). Our circular DNA plasmid pUC19 has >1 CAGCTG sites, which leaves multiple PvuII-cut fragments that can be separated into size-dependent bands by gel electrophoresis. This week we will cut DNA and compare the sizes of cut fragments to predicted outcomes from the sequence map of our plasmid. Pipette DNA ladder into the first well, an uncut plasmid negative control into the second well, the 37C-incubated PvuII-cut sample into the third well, and the 4C-refrigerated sample into the fourth well. 6.Image DNA separation through an orange filter over a blue-LED transilluminator.